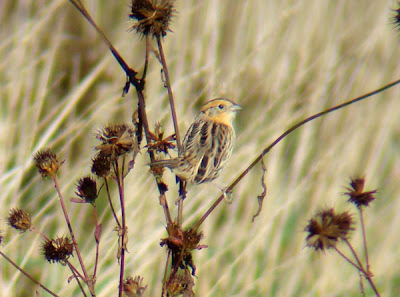 Birding, listing, and digiscoping in Kent Co., Michigan and beyond. Well, several more days of searching (including 2 trips to Hofma Preserve and 2 more to Roselle Park) for our elusive visitor have come up empty-handed, although I still think we're getting hotter. To date, we have now located at least 4, probably 5 separate individual Le Conte's Sparrows, a species which I'd never seen as a migrant in my life prior to this fall's targeted search. 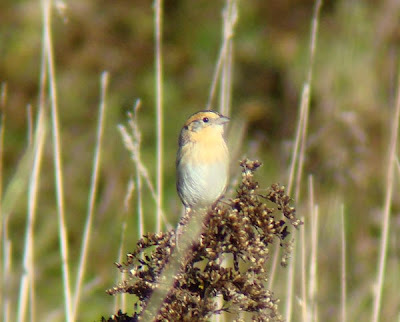 Here is the latest individual, a particularly confiding bird, from Roselle Park this morning: With all the reports of Nelson's Sparrows from surrounding states in the last 10 days, I thought it would be interesting to plot a map of those sightings. (Format = # individuals, date) I really don't think it's possible that a bird found this regularly this close to Michigan is truly a vagrant-only in our state. It may indeed be rarer here than in WI, IL, OH, ON, etc., but I cannot believe that it just isn't here right now. I am starting to think that we may not have exactly comparable habitats (for example, we lack a dredge spoil jutting out into Lk Michigan such the Milwaukee Coast Guard Impoundment, and places with thick, relatively homogeneous smartweed patches such as Nine Springs, Milwaukee), but this may mean we just need to figure out what our best habitats are. With the end of the migration window rapidly approaching, I am hoping for paydirt in the next week. The cold weather certainly can't hurt! Under this model, nelsoni would be much less likely than alterus to pass through Michigan. 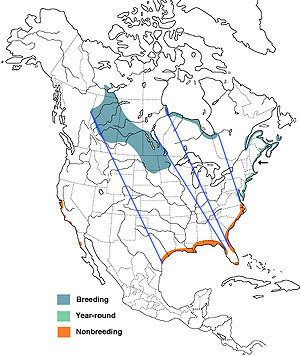 Of course, this assumes that my two-dimensional lines correlate with actual migration routes on a three-dimensional surface (and that birds do not take circuitous routes), and doesn't consider that alterus might be outnumbered considerably by nelsoni (the only estimate I know of is the Partners in Flight estimate for the entire species of 510,000, lacking subspecific breakdowns). If either of these assumptions were broken, my conclusions would be invalidated. Rising and Beadle 2002 (Sparrows of the U.S. and Canada: Photographic Guide) state that "most of [alterus and subvirgatus] apparently winter on the S. Atlantic coast whereas most of [nelsoni] winter on the Gulf Coast." This is slightly different from what Pyle says. This scenario might look like this: This has alterus being the only likely possibility for Michigan. Unfortunately, alterus and nelsoni are not separable in the field (and often not in the hand). Still, Granlund, McPeek, and Adams 1994 (The Birds of Michigan) states that "specimens indicate that [A. c. (sic) nelsoni] ... primarily occurs in Michigan. It is not clear what criteria were used to identify the specimens to subspecies. One final source of information is the range maps given in Sibley (2000) and subsequent editions. Sibley 2000 shows migration corridors (in yellow) occuring thinly through the central Great Plains, SE Wisc., Ill., Missouri (presumably for nelsoni), and Pennsylvania (presumably for alterus). To what extent this represents where birders are finding and reporting the birds rather than their actual distribution is unclear. Unsurprisingly, my guess will be that the actual corridors used are far wider than this. Don't speak 4 letter code? See here. Lifelong birder who occasionally thinks about other things.